On the day speakers from ActionAid, Trinity College Dublin, and Plan International presented interesting topics for debate among the audience. Makena Mwobobia, Executive Director of ActionAid Kenya and ActionAid International’s Champion on its Humanitarian and Resilience Platform. Makena focused on women’s leadership in humanitarian response, in particular, ActionAid’s Feminist Humanitarian Network. Professor Sam Cromie, Assistant Professor in Psychology at Trinity College Dublin, presented on his work in partnership with Tearfund working with self-help groups. Anne-Marie McCarthy, Emergency Programmes Manager, Plan international Ireland. Anne-Marie discussed Plan International’s gendered response to humanitarian situations. Women’s Leadership in Humanitarian Contexts is an important subject for ActionAid, as women’s leadership is core to our humanitarian response. Women are often worst affected by emergencies, as well as often the first responders. In particular, women are more vulnerable to assault during crises. In addition, breastfeeding mothers and pregnant women are overlooked when men lead the response. And so, we promote women affected by crises to lead the response in their area. In addition, ActionAid promotes local organisations in communities. We enhance their capacity to respond, helping with programme design and response. And supporting access of local leaders to national funding and advocacy opportunities. We also ensure to link our humanitarian response to resilience building and long-term sustainable change. 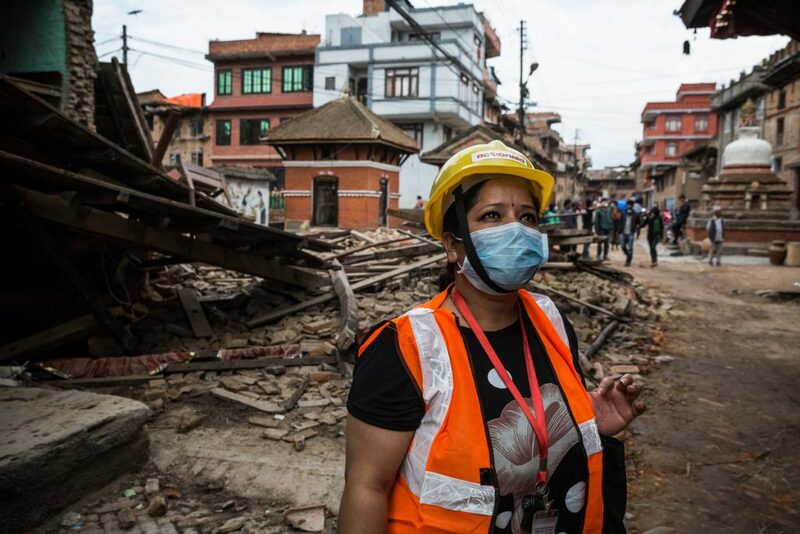 Photo credit: Malati Maskey responding to the 2015 earthquake in Nepal.